3 mm thick, ground stainless-steel front panel of high-quality Nirosta V2A stainless steel. This makes it especially resistant to environmental influences and vandalism. � Screwless installation system. Unlocking is carried out with a special opening tool included with the product. � Depth of flush-mounted box: 40 mm � Flush-mounted box with wall anchors and openings for cable feed. � Special design principle of the loudspeaker and microphone for avoidance of vandalism and moisture penetration. Due to the design used, it is not possible to puncture the loudspeaker or microphone with a sharp object. � Hands-free feature (voice-controlled talk-back with echo and background noise suppression) � Adjustable speech volume. � Vandalism-protected stainless-steel call buttons. These are recessed flush in the front panel and have a precise switching behaviour when a call button is pressed. � Acoustic acknowledgement signal when call button is pressed (can be deactivated if necessary). � Night design of stainless-steel call buttons. Illumination with white LED illumination. � The inscription area or the name plates are uniformly illuminated with maintenance-free, energy-saving white LEDs. � The cover windows for the name plates are recessed flush in the front panel and consist of shatter-proof, scratch-resistant, 5 mm thick safety glass. They are therefore especially impervious to vandalism in the form of impacts, fire, scratching etc. In addition, they are easy to clean when soiled. � The name plates can be removed from the front without dismantling the door station stainless steel. The unlocking device of the name plates is concealed. � The name plates are protected against sprayed water. 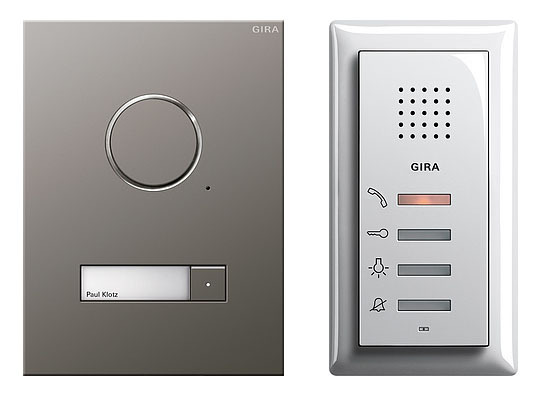 � The door station stainless steel is supplied ready for connection including built-in loudspeaker and, for larger buildings, including an expansion module. This eliminates time-consuming wiring of the call buttons. Only a Gira 2-wire bus is required for connection of the door station stainless steel. � A catch strap and supporting surface in the flush-mounted box serve as mounting aids during installation. � One-man commissioning through simple commissioning procedure. � Circumferential sponge rubber seal for wall sealing on the underside of the front panel. � Large coverage between flush-mounted box and masonry.